The Android Lollipop update is gradually getting seeded into many high-end smartphones. While the Sony Xperia Z Ultra GPE model received the update on Wesneday, Samsung’s flagship smartphone, Galaxy S5 has reportedly got the Android 5.0 Lollipop update in Europe. According to a SamMobile report, the Galaxy S5 units with the model number SM-G900F have received the latest Android update with the LRX210 build and version G900DXXU1BNL2 in Poland. It is slated to hit the other countries in Europe soon. 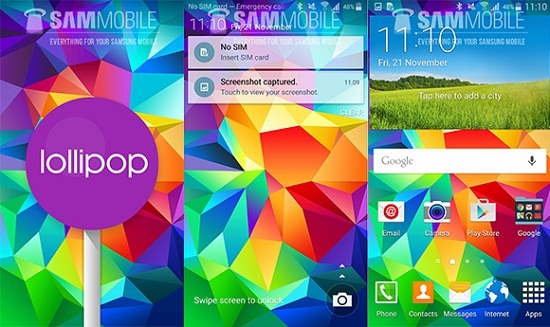 From the screenshots that have been posted in the report, the Galaxy S5 appears to have received a better touch response as it is layered with the TouchWiz version of Android Lollipop. The notable changes as seen in the screenshots include Lollipop styled toggle buttons, dialer app, calendar, interactive notification tray heads-up alerts, lock screen notifications, multi-user support, MirrorLink, Smart Lock and some Material Design features. The global users of Galaxy S5 will have to wait for the update as it might take sometime for them to receive the Android 5.0 Lollipop.